After capturing the attention of nearly 30 million users since its 2010 debut on the App Store, Instagram has finally made it to Android. In case you missed the memo, Instagram is a free, social-centric camera app which aims to make sharing photos on-the-go as quick and painless as possible. Although relatively faithful to its iOS counterpart, there are a few differences between the original and Android versions. Tilt Shift / Blur, Share from Feed, Live Preview and Share to Flickr are nowhere to be found on Android handsets and tablets. Instagram, however, intends to resolve those deviations in future releases. 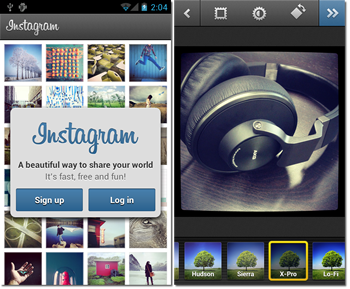 Instagram for Android works with version 2.2 and higher, which covers the vast majority of Android-based devices out there. The company reasons it requires OpenGL ES 2 support, a feature not present before Froyo. The company is somewhat of a phenomenal success story, despite offering their product for free and having only 13 employees. Thanks to a virally swift adoption amongst social media users, Instagram may be worth about 20 times what it was just a year ago as venture capitalists consider pouring $40 million into the company. According to the company, 430,000 users were on Instagram's Android app waiting list by launch day. Over 1 billion photos have been uploaded using the service and is currently about 5 million each day. Each second, Instagram receives 575 likes and 81 comments.